This folder has multiple encrypted subfolders as well. I dragged a couple of files from my desktop to an encrypted subfolder. The files disappeared from my desktop, but they did not appear in the encrypted subfolder. Undoing did not work, with a modal window showing that the files could no longer be found. I saw this question and while the symptoms are similar, the circumstances are different. The encrypted main folder is in the root directory (C:/) unlike in that question's shared network folder. Also, I used the same user account to create the encrypted folder, do the actual encrypting, create the files that disappeared, and try to move them to the encrypted folder. Permission should not be an issue, I think? What can I do to retrieve the missing files? 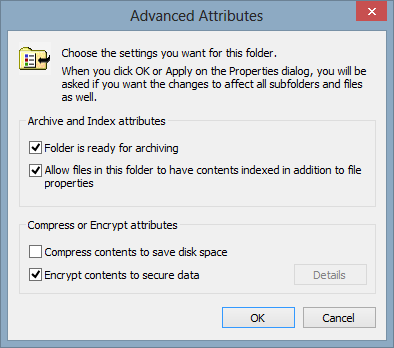 What is the correct way to move files to encrypted folders so that they don't disappear? Try un-ticking "Hide protected operating system files" in folder options. For me, this brought the files back in their original locations. Not the answer you're looking for? Browse other questions tagged windows-8 or ask your own question. How to configure a windows account to save files only to a specific folder?